Vanishing of the Bees - A film documentary about the mysterious disappearance of the Honeybee and Colony Collapse Disorder. How does pollen get from one flower get from one flower to another? Flowers must rely on others vectors to move pollen. These vectors can include wind, water, birds, insects, butterflies, bats, and other animals that visit flowers. We call animals or insects that transfer pollen from plant to plant "pollinators". Did you know...Honey bees are the only insects that produce food eaten by man. The honey bee or Apis mellifera was brought to the United States from Europe by the early settlers. Since the arrival of the honey bee to North America the honey bee has become our most important managed pollinator. Honey bees pollinate one third of all the food we eat, from almonds to watermelon and everything in-between. 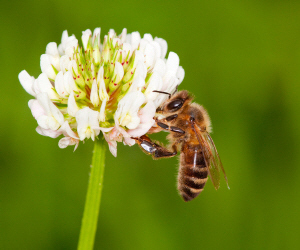 The honey bee also pollinates livestock forages including alfalfa and clover. Unfortunately, honey bees are having a hard time surviving due to a condition called Colony Collapse Disorder or CCD. How you can help...start by planting flowers that attract bees which will supply honey bees with food, provide a shallow pan of water for the honey bees to drink from, a temporary shelter such as a large bush in case honey bees get caught in the rain or wind, and sunning spots such as a rock where honey bees can warm themselves are all important things you can do to help improve the strength of the honeybee population. Also, eliminate or limit the use of insecticides. Albert Einstein once said, "If the honey bee becomes extinct, mankind will follow within four years". Plant Native - Native plants are four times more attractive to native pollinators than other ornamental plants. Choose plants that bloom at different times - This provides ongoing food and habitat throughout the growing season. Choose flowers that have a variety of shapes and colors - Different pollinators are attracted to different colors and shapes of flowers. The more varied your garden, the more varieties of pollinators you will attract. Avoid using pesticides (especially insecticides) - This is particularly important where the pesticides may come in contact with local pollinators.